Do you have something in your game you can expand on and give your player’s a better experience? Maybe it is a matter of simply taking what you have and making a small, value adding change. In the case of Boss 101 it’s hats. Lots and lots of hats. A little backstory – hats in Boss 101 are just one way for us to give players a neat customized look for their characters. It’s relatively low cost for us but the payoff is really high when you see it in game. Today we are talking about character dress up – specifically HATS! Who doesn’t want cool lids to go into battle with? Valve sure thinks you want them in Team Fortress 2 and we are giving them to you in Boss 101. For a long time we had hats in the game as buffs to your powers. Extra health, extra firepower, etc. Some hats were especially good against certain types of bosses and others gave you money bonuses depending on what you were attacking. All good things. What was missing though was that last little touch to make the hat special. 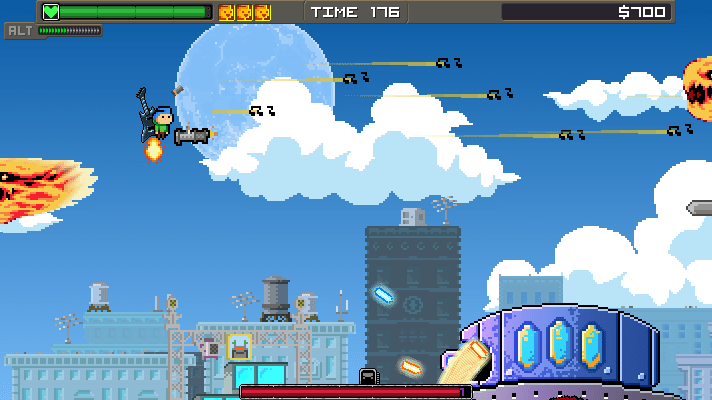 Well, along came an idea while we were working on another system to add abilities for hats, ammunition and bosses. We call it the “alt” system and what it does is allow us to replace one thing for another on the fly. We can use the alt system to allow things a bullet to doing more or less damage on certain types of bosses but the best part is we can use the system to replace one sprite for another. It wasn’t a far stretch from there to make the leap of replacing the player’s machine gun bullets with special bullets related to the hat you are wearing. This was an easy change requiring additional art but we believe it’s well worth it. To date we have over 200 hats in the game and nearly every single one has its own custom bullet to add that much more flavor. Here you have the Hat Store with all the lids you will need. 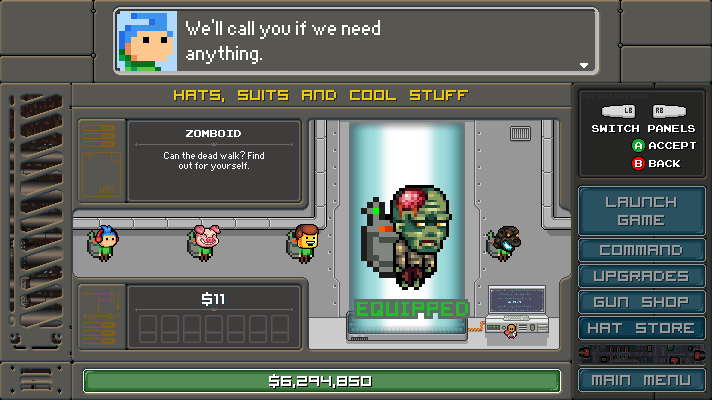 And now the Zombie hat in battle – TOSSING BRAINS. And a guitar hat – BLASTING NOTES. 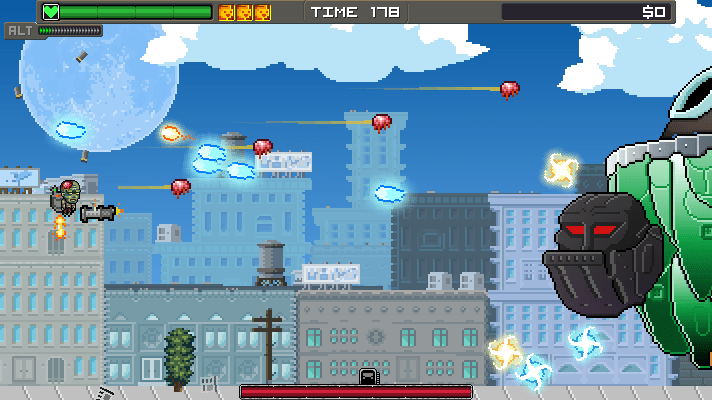 And Major Mayhem – THROWING SHIELDS.